Software application development has never been more in demand, thanks to rapid technological advancements that allow for more and more powerful devices. With the global software industry at a continued rise, reforms within organizations to improve their efficiency at software development have emerged. One of the most effective processes for software development is agile development, in which development is done in small, repeated cycles instead of a single start-to-finish process. You may read more on agile development and agile developers from our blog. In this article, we take a look at the most popular agile method today: Agile Scrum. Scrum is an agile software development framework that promotes adaptability to change. It was created in 1995 by Jeff Sutherland and Ken Schwaber, and they published and now maintain the Scrum Guide which formally lays down the details and ideals of the framework. In the Scrum Guide, Scrum is defined as a framework that provides businesses with a solution to complex, adaptive problems while maximizing quality and business value. Moreover, the framework is claimed to be simple to understand, yet difficult to master. In a nutshell, with Scrum, software development is divided into a fixed time box of two to four weeks, during which one complete cycle of development transpires and a working increment of software is produced. Every sprint begins with Sprint Planning, in which items to be developed for the sprint are laid down. The bulk of a sprint is then spent on development work, in which a Daily Scrum meeting is held by the development team to remain on track with each other’s progress. At the end of each sprint are two meetings: a Sprint Review, where the client, referred to as the product owner, evaluates the delivered working increment, and a Sprint Retrospective, where the development team discusses possible improvements for the next sprint. Moreover, for large Scrum projects, the team must be divided into Scrum Teams, each having 3 to 9 members. It’s also a must that the product owner establish direct communication with the developers to maximize productivity. Scrum is by far the most common agile methodology in use. According to VersionOne’s 11th State of Agile Report, in 2016, 58% of all organizations practicing agile development used the Scrum framework alone, while many other organizations used a hybrid of Scrum and other methods, such as Extreme Programming or Kanban. In fact, Scrum Alliance claims that of all organizations and individuals using the agile approach, 89% use at least some elements of Scrum. Let’s briefly take a look at the benefits and drawbacks of implementing Agile Scrum in software development. Working, Usable Increments – At the end of every sprint, the development team delivers a working, testable product, so even when a project does not finish, the product owner will have something that, although lacking in functionality, is still usable and has some business value. Lightweight – with only a few guidelines to follow, Scrum is very easy to understand, and it won’t take a lot of effort to remember all its rules. Early Error Detection – With Scrum’s iterative nature, errors can easily be detected before every sprint ends, so such errors won’t pile up at the end of the project. Client Involvement – Agile Scrum requires that the client or product owner be in constant communication with the developers and that they be present in Scrum meetings. As such, it will require the time and dedication of the product owner. Requires Everyone’s Commitment – By nature, scrum is a fast-paced framework that requires a lot of discipline from the entire team in order to be fully implemented. Lack of commitment from any member can easily collapse the framework and lead to the project’s failure. A Scrum Team is composed of three roles. First is the Product Owner, often the client, who is solely responsible for deciding on the requirements for the product and reviewing the deliverables in each sprint for acceptance. Next is the Scrum Master, who ensures that everyone adheres to the rules and guidelines of Agile Scrum. Finally, there’s the Development Team, consisting of the software developers who write the actual code. Together, the members of the Scrum Team are expected to work together and commit to the Scrum guidelines. It is only by doing so that the benefits of Agile Scrum may be reaped to its fullest potential. The Professional Scrum Master Certification is granted to individuals who have proven some level of mastery of the Scrum framework, making them fit for the role of Scrum Master. This certification has three levels, each requiring one to pass an exam. The first level, PSM 1, requires mastery of fundamental Scrum concepts. The second level, PSM 2, requires mastery of advanced concepts as well as situational problem solving abilities. The third level, PSM 3, requires complex problem solving skills, as well as either an extensive experience as an Agile Scrum Master or the completion of the Professional Scrum Master course. The Professional Scrum Product Owner Certification is granted to individuals who have shown some level of understanding of the Scrum framework and the ability to apply it to maximize the value of a software product. This certification has two levels. The first level, PSPO 1, requires mastery of core Scrum concepts from the perspective of a Product Owner, while the second level, PSPO 2, requires complex situational problem solving skill relating to Product Ownership. The Professional Scrum Developer Certification is granted to software developers who have proven their full understanding of how to use the Scrum framework to develop complex software. This certification only has 1 level, and requires one to pass a 60-minute, 80-question exam. The Scaled Professional Scrum Developer Certification is granted to those who exhibit an understanding of the Nexus Framework, an extension of Scrum, that focuses on effectively guiding large Scrum projects consisting of multiple Scrum Teams to effectively work together while minimizing dependence on each other. This Nexus Framework therefore results in what is known as the Scaled Scrum framework. 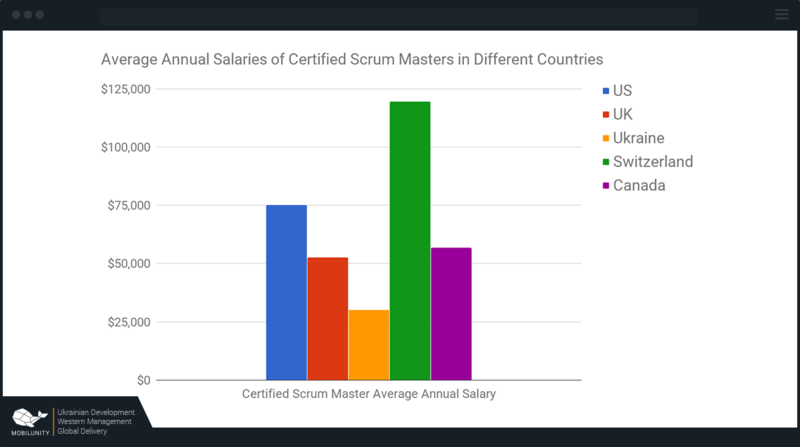 The above comparison shows clearly that Ukraine offers the lowest rates for certified Scrum Masters. If you’re in need of professionals for Scrum project management or you want to implement agile and Scrum into your business processes, hiring a Scrum manager from Ukraine will therefore be your most practical option. If you’re looking to hire Scrum developers or Scrum Masters who can carry out agile project management with Scrum, one of the best methods to do so would be to hire dedicated remote developers. These professionals don’t need to physically be in your office, because the Scrum framework is effective even for people collaborating from different parts of the globe. In fact, the Scrum framework makes such an arrangement easily manageable, when it would otherwise be very difficult to pull off with a non-agile process. Remote members in a Scrum Team will only need to use collaboration and communication tools such as Skype and Git in order to carry out collaborative development and the regular meetings such as the Daily Scrum, the Sprint Planning, Sprint Retrospective, and Sprint Review. Moreover, the Scrum Team only needs to agree on a 15-minute common time every day to hold the Daily Scrum, and schedule the other Scrum meetings once every sprint. As long as every member of the Scrum Team commits to adhere to the Scrum guidelines, hiring dedicated remote developers and Scrum Masters to carry out Scrum project management will prove to be both very economical and highly effective. If you’re planning to hire dedicated developers or Scrum Masters to carry out agile project management with Scrum for you next software project, you’re in luck! We at Mobilunity have everything to meet your Scrum needs. We house Europe’s best IT professionals, and our Scrum Masters and Scrum developers can help you make your agile project a big success. What’s more, we are located in Ukraine, so our low rates are hard to beat. Contact us now and let’s get your Agile Scrum project started! How to Hire Top JQuery Developer for Your Project?